The region's most popular festivals originate from a wide variety of religious and cultural traditions. The Buddhist worldview inspires Songkran and Vesak; the Taoist tradition celebrates Chinese New Year and the Hungry Ghost Festival, and the Muslims celebrate the month-long Ramadan fasting season and Eid al-Fitr at its end. As most of these traditions follow different calendars, the dates vary relative to the Gregorian calendar; we've included their dates to as far as 2020. The significant ethnic Chinese presence in Southeast Asia celebrates its biggest festival during Chinese New Year. All across the region - but most especially in Penang, Singapore,​ and Vietnam - street bazaars, fireworks, and family reunions mark the changing of calendars. Penang in particular specializes in Chinese New Year foods that are rarely served at any other time of the year; in Singapore, families celebrate by preparing and eating the tossed raw-fish salad known as yu sheng. The Tamil Indian community in Malaysia and Singapore celebrate Thaipusam to honor the Hindu god Subramaniam (Lord Murugan); thousands of devotees carry painful-looking offerings called kavadi, attached to each devotee's skin with 108 metal skewers each. In Kuala Lumpur, Malaysia, Thaipusam festivities take place at the Batu Caves, where the procession ascends 272 steps up to a cave chamber marked with a massive statue of Lord Murugan. A smaller procession takes place in nearby Penang, where the procession moves from the Nattukottai Chettiar Temple to the Arulmigu Balathandayuthapani hilltop temple. This traditional new year celebration occurs around the end of the planting season, now codified to occur between April 13 to 15 every year. Historically, the region's farmers had a rare break in their busy planting schedules at this time of year and could take time to celebrate with their communities. 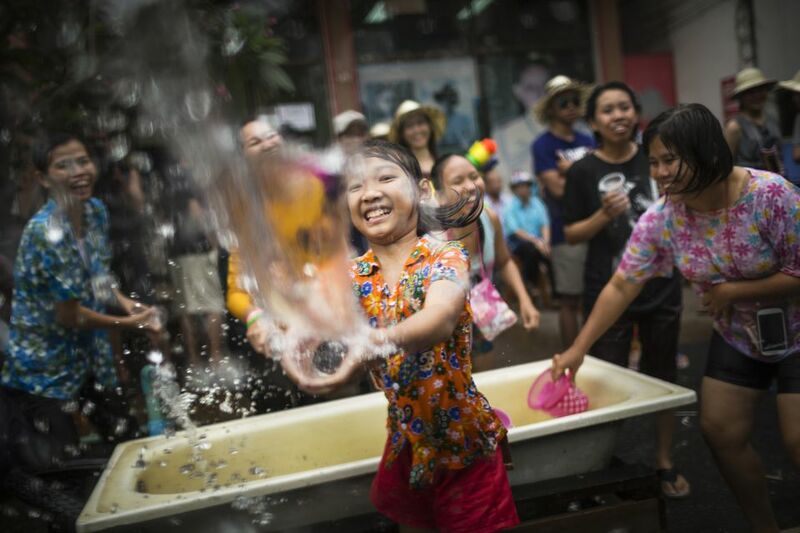 The celebrations are marked with the act of throwing water on passersby, whether in Thailand's Songkran, Cambodia's Chol Chnam Thmey, Laos' Bun Pi Mai, and Myanmar's Thingyan. Devotees in each country believe that water washes away bad luck; thus anybody on the streets is fair game to be drenched with water pistols or smeared in wet talcum powder. Buddhists in Southeast Asia celebrate the birth, enlightenment, and death of the Buddha on Vesak; as it's believed that good deeds done on this day will return more merit than any other time of the year, Buddhist communities redouble their efforts to do deeds of generosity on this day. The most scenic Vesak celebrations take place near Yogyakarta in Indonesia - thousands of Buddhists from all over the world gather at Borobudur in a procession bearing sacred objects like holy relics, volumes of holy books, and offerings; after ascending to the pinnacle, monks release sky lanterns into the air to commemorate Buddha’s bringing enlightenment to the world. Throughout the fasting month of Ramadan, the Muslim communities in Southeast Asia come together to feast after dark. Tourists can chow on Ramadan food at the "pasar malam" or night markets that populate the streets - take your pick from curries, rice cakes, and other Malaysian street foods; or browse through clothes, souvenirs, and CDs on display. The end of Ramadan - Eid al-Fitri, or Hari Raya Puasa in Malaysia - is met with joy, as families stage get-togethers and congregate at the mosques for Thanksgiving. Places like Istiqlal Mosque in Jakarta, Indonesia come alive with exultant devotees (join them if you like, just observe proper mosque etiquette). Singapore's significant Malay Muslim population can be found partying mainly in Kampong Glam, Singapore. The Balinese celebrate the victory of good (Dharma) over evil (Adharma) during the festival season known as Galungan. Following the 210-day Balinese Pawukon Calendar, Galungan takes a full ten days to celebrate, within which the spirits of the ancestors are believed to be visiting, thus encouraging the Balinese to show their gratitude to the divines in different ways. Families offer bountiful sacrifices of food and flowers in their family altars and at local temples; the sides of houses sprout tall bamboo poles called "penjor", and villagers welcome the mythical beast known as the "barong" into their homes, in an exorcism ceremony known as Ngelawang. Following the Taoist belief in the afterlife, the Hungry Ghost Festival marks the seventh lunar month, when the afterlife momentarily allows the spirits of the dead to roam in the world of the living. For Chinese communities in Malaysia (particularly Chinatown) and Singapore (particularly Penang and Melaka), the Hungry Ghost month is a time to make offerings of food and burnt prayer money to the deceased to appease them. Stages are set up to entertain the ghosts (and the living as well) with music and theatrical performances. Known elsewhere as Diwali, the Tamil Indian community in Singapore and Malaysia celebrates Deepavali to commemorate Lord Krishna's victory over Narakasura, cementing the victory of good over evil. Deepavali is also the Hindu equivalent of the new year; Indian families take time to hold reunions through the season. In the Singapore ethnic enclave of Little India, street markets flourish outdoors, dispensing spices, flowers, fine clothing, and traditional dishes to locals and tourists alike. The Christian population in Singapore and the largely Catholic Philippines throw the biggest Christmas celebrations in the region. Singapore's Christmas in the Tropics coincides with massive street light-ups, shopping specials (read about shopping in Singapore) and parties ramping up to the New Year festivities in Sentosa and Marina Bay. In the Philippines, the capital Manila experiences massive gridlock leading up to Christmas - families hold reunions during the Yuletide season and hang up lanterns called parol outside their houses. The Giant Lantern Festival shows off the biggest and brightest of these parol.